Carlos Hyde has been ruled out for Sunday's game versus the St. Louis Rams with a stress fracture in his foot. yards and 3 touchdowns has been ruled out for Sunday's game versus the St. Louis Rams. 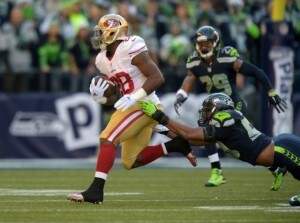 Carlos Hyde has been ruled out because of a foot injury that has been nagging him the past couple of weeks. Hyde had a huge first week against the Minnesota Vikings with 168 rushing yards, scoring 2 touchdowns, while averaging 6.5 yards per carry. Since then Carlos Hyde has only averaged 3.4 yards per carry while dealing with this foot injury that has been described by some as a stress fracture. The good news for the 49ers is that there is room to run on the Rams speedy defense. They are built for speed and have a very good defensive line, but their defensive ends are undersized and you can run off tackle on them pretty well. So far this season the Rams defense has given up double digit fantasy points to opposing running backs except versus the Green Bay Packers. The 49ers don't want to get into situations where they have to throw the ball. The Rams defensive line will eat them alive in those situations. Another thing you don't want to do is try to run outside the tight end because the Rams are too fast for that. The 49ers will definitely want to run right at them off tackle. The Rams defense is ranked 15th in the NFL versus the run, giving up 108 rushing yards per game. The 49ers started the year calling themselves a power running team and they must get back to that Sunday versus the Rams even though they will not have Carlos Hyde running the ball. Once they establish a running game, or at least keep the Rams defense honest, then hit them with their play action passing game. 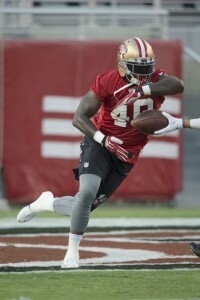 The three running backs that have a chance to step up on Sunday will be Reggie Bush, rookie Mike Davis, and Kendall Gaskins. 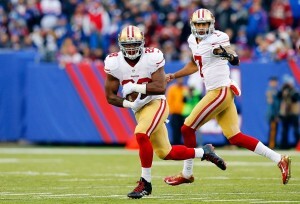 Reggie Bush will be the starter at running back for the 49ers versus the Rams. He should be able to score 6 to 12 fantasy points. has been battling through a strained calf that he sustained in the preseason, but after last week's game versus the Seahawks he said he finally feels healthy and back to normal. So far this season Bush has only been used in passing situations, but he can run off tackle some he just can't do it every Sunday and be expected to stay healthy all season. Bush does have blazing 4.3 speed, so if you give him a crease he can take it the distance from anywhere on the field. One big way Bush can burn the 49ers is on running situations where Rams middle linebacker James Laurinatis will be in the game. This is where the 49ers should throw the ball and get Bush locked up with Laurinatis in one on one coverage or at least to where Laurinatis has to try to tackle Bush in the open field. Laurinatis is the one player on the Rams defense that does not have great speed. 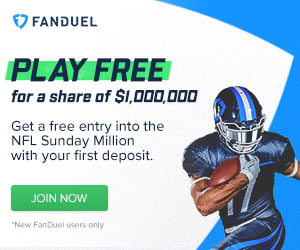 I believe that Bush will score at least 6 fantasy points, but have a shot to score 10 to 12 points if the 49ers use him in the right way. Mike Davis should get a chance to show what he can do versus the Rams. South Carolina. I feel that they really reached with Davis at that spot. I had him ranked as the 21st best back in the draft. He has pretty good size at 5.9 and 217 pounds, but he is slow by NFL running back standards, being clocked in the 40 yard dash at 4.61 seconds. Rams defensive tackle Aaron Donald and defensive end Robert Quinn are both faster than Davis. So far this season Davis has rushed the ball 15 times for 20 yards, a dismal 1.3 yards per carry. When Davis comes in the 49ers had better use him on straight ahead north and south type of plays. 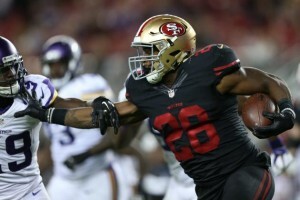 Gaskins was signed to the 49ers active roster on Saturday with the injury to Carlos Hyde. he spent the remainder of the season. He signed a reserve/future contract with San Francisco on December 30, 2014, was released on September 5, 2015, and then signed to the practice squad the following day. Gaskins is a big back, really more of fullback size at 6.1 238 pounds. He has been clocked at the 40 yard dash at 4.7 seconds, which is really slow for an NFL running back. He could be used as a short yardage/goal line back and also work as a full back. He is not going to have much success running the football with his speed.